Brent Waler has been in the car business since he was 16, when he got a job washing cars at a local dealership. The past 40 years have seen him climb the proverbial ladder, and he’s spent the last 30 years as a dealership sales manager. He’s been fortunate enough to drive many special cars and travel the world, no small feat for a man who got his start working with a washcloth. But nothing Brent has experienced in his career could have prepared him for the job training waiting for him in East Liberty, Ohio; Brent is an Acura sales manager, and to be able to carry the 2017 Acura NSX, Acura managers have to fly to the mid-engine hybrid supercar’s birthplace in central Ohio to train with the Acura Performance team. And so it was that Brent, along with Director of Parts and Service Curtis Hancock, boarded a plane for Columbus and the 7.5-mile Transportation Research Center (TRC) test track. When Brent arrived at his hotel, he was given his orders for the coming day: report to the Acura facility for training, but leave your cell phone at the hotel. Those who brought any device that could record sound or capture images would be sent home. Exhausted from flights, shuttle rides, and weather delays, Brent couldn’t help but grin to himself: while his co-workers in Oregon clocked in for the day tomorrow morning, he would be driving a car so important that it has its own security team. A shuttle took Brent and the other Acura managers in attendance to the Acura facility, where the day’s events were outlined, and after ensuring that everyone had left their phones behind, the day everyone in the room had been waiting for began in earnest. The Transportation Research Center is an independent automotive proving ground that lends its services to many of the vehicles produced in the Midwest. 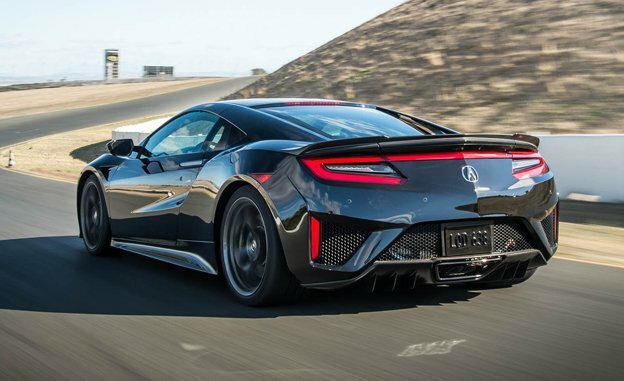 Acura and Honda have their own test track, and it was there that Brent got to put the NSX through its paces. After taking a leisurely drive with an instructor, Brent saddled up for a timed lap with an Acura Performance racing instructor. His NSX training completed, Brent returned to the hotel and a rental car that felt positively forlorn in comparison to the work of art he had just become one of the first Oregonians to drive. Upon returning home to Ashland, he set to work making sure that his dealership got an NSX sooner rather than later. So after driving the NSX and riding in it with a professional driver, what does Brent love the most about the vehicle he’s been waiting for since 2012? He could name any number of things, but his love affair with the 2017 NSX begins and ends with the engineering that kept us waiting for so long in the first place. He may have been born and raised in Oregon, but Brent Waler died and went to heaven in rural Ohio.